Can legislation on salt iodization be harmonized in Europe? 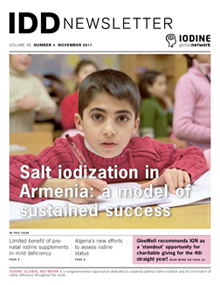 By sustaining universal salt iodization (USI), Armenia has remained iodine sufficient for over a decade, effectively protecting newborns against brain damage and loss of I.Q. points. This is the first randomized placebo-controlled trial investigating the impact of iodine supplementation of mildly iodine-deficient pregnant women on child neurodevelopment. A recent sentinel survey in northern Algeria suggests iodine intakes are optimal in pregnant women but borderline high in women of reproductive age. Harmonized assessment of iodine status in Europe has the potential to overcome negative health outcomes of iodine deficiency, including cognitive deficiencies. The joint WHO and UNICEF report published in 2007 on “Iodine deficiency in Europe: A continuing public health problem” described the situation of iodine deficiency in Europe as a major public health concern. Here, we aim to identify the missing ingredient and propose a solution that could help to eliminate iodine deficiency in Europe. In December 2016, the Iodine Global Network with support from Nutrition International, and in partnership with UNICEF, GAIN, TFNC and other national stakeholders, conducted a comprehensive review of Tanzania’s IDD program to determine its current status, identify gaps, and recommend steps to improve the supply and use of adequately iodized salt. Iodine deficiency was first recorded in North Korea in 1995, and the government started efforts to produce iodized salt soon after. On the invitation of UNICEF, the Iodine Global Network visited in January 2016. A Paleolithic-type weight-loss diet (known as paleo diet or PD) has beneficial metabolic effects, but it excludes two largest iodine sources: table salt and dairy products. A 2-year randomized trial compared the risk of iodine deficiency in Swedish women on a PD compared with the Nordic Nutrition Recommendations (NNR) diet. In response to the alarming news of iodine deficiency in Vietnam, UNIBEN Company actively collaborated with experts from the Nutrition Center of HCM City to develop a new food product, iodized bouillon, and distributed it to millions of Vietnamese families.